MSC Cruises is the biggest privately-owned cruise line in the world, and the fourth-largest cruise line. It is also the fastest growing and has one of the youngest fleets, with a ship on order every year through to 2026. Geneva-based firm Mediterranean Shipping Company is one of the world's biggest players in international shipping. It began its operations in 1970 with a single ship and expanded to passenger cruising in 1988. Gianluigi Aponte, owner of Mediterranean Shipping Company, acquired Starlauro, a one-ship cruise line whose fleet consisted of the Achille Lauro (which had been hijacked by Palestinian terrorists in 1986). This first ship continued its troubled history, even while under the MSC flag. In 1996, the Achille Lauro, while sailing a passenger cruise, caught fire off the coast of Africa and, ultimately, sank. All passengers were safely rescued. The turn of the millennium was a massive breakthrough for MSC, when huge container ship operator Mediterranean Shipping Company, the line's parent, decided it was time to expand its presence in the cruise market. The result was an order for a pair of brand-new 58,000-ton ships -- the very first new-builds in the company's history. Three years later, in 2003, the company took delivery of their first-born, MSC Lirica, setting off an epic expansion that would catapult MSC to the number four spot worldwide -- and number two in Europe -- in a matter of years. MSC Opera debuted in June 2004, carrying 1,756 passengers. The line then bought several vessels from the defunct First European/Festival: MSC Armonia and MSC Sinfonia; both ships measured 58,625 tons and carried 1,566 passengers. The ships in the Lirica Class were stretched and expanded through the line's Renaissance program, adding additional staterooms to each vessel. The introduction of a new class of ships -- larger, more amenity-laden and featuring an even higher ratio of private verandahs -- emerged with MSC Musica. Measuring 89,600 tons and accommodating 2,550 passengers, that class "master" was launched in June 2006; siblings include MSC Orchestra (debuted in spring of 2007) and MSC Poesia (spring 2008). MSC Magnifica, the fourth ship in the Musica class, launched in 2010. The Fantasia Class of ships followed in 2008. MSC Fantasia (137,936 tons, 3,274 passengers), which debuted in December 2008, was the first of four Fantasia-class vessels. Sister ship MSC Splendida (137,936 tons, 3,274 passengers) debuted in 2009, and MSC Divina (139,072 tons, 3,502 passengers) arrived in May 2012. MSC Preziosa (139,072 tons, 3,502 passengers) joined the fleet in 2013. These two post-Panamax-sized vessels are based on a unique protoype that incorporates first-ever features, such as the ship-within-a-ship Yacht Club concept for suite holders, a pool with a magrodome for all-seasons swimming and an interactive center with a 4D theater and a Formula One simulator. In 2014, MSC announced four new ships, the first of which -- MSC Meraviglia -- debuted in June 2017. It is by far the biggest ship the line has launched -- and the fourth biggest in the world. The 171,598-ton, 4,475-passenger ship also marked the start of a massive (nine billion euros) ship-building program that will see a megaship launched each year until 2026. In November of the same year, MSC Seaside lauched -- which heralded another new class of ship -- Seaside. 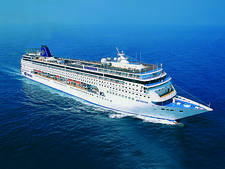 The ship is smaller than Meraviglia at 160,000 gross tons and 2,067 cabins holding 4,134 passengers in double occupancy. It launched in Miami, and has a design to reflect that city, with a unique aft which looks like a Miami condo. It also has a widened boardwalk to reflect the fact people will want to spend a lot of time outside, with shops, restaurants and bars. Seaside was christened in Miami and homeports there year-round, in a further bid for the line to break into the U.S. market. 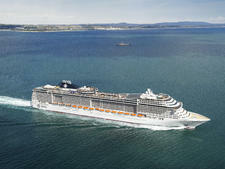 A second Seaside class ship -- MSC Seaview -- followed in June 2018. 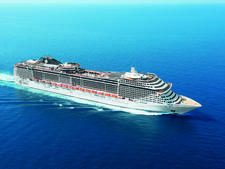 Of the forthcoming ships, MSC has revealed a number of names: MSC Bellissima, the second in the Meraviglia class, which launches in Southampton in March 2019; Grandiosa, its first Meraviglia-plus class vessel, which also launches in 2019; and Virtuosa, a sister to Grandiosa, which launches in 2020. A variation of Seaside class -- Seaside Evo -- launches in 2021 (a second follows in 2023); and a brand new class -- World Class -- launches in 2022. At time of writing, four World Class ships are planned. The line has also set its sights on China: MSC Lirica made its homeport in Shanghai in May 2016, initially for two years. It also ventured into Cuba, basing MSC Opera there in 2015 and MSC Armonia in November 2016. Uniquely, in an era in which cruise lines choose a different celebrity godmother for each ship in the fleet, the Mediterranean-influenced MSC has remained loyal to legendary actress Sophia Loren. She's served as godmother for every new ship since MSC Lirica. Whether new ship or old, MSC Cruises emphasizes a strongly Mediterranean-influenced ambience. For the most part, its ships traverse the Med (winter and summer) and are geared to European travelers. But the line has made a major commitment to not only sail elsewhere (South America, Canada/New England, the Caribbean, South Africa, the Gulf), but also to expand its passenger base to include English-speaking travelers. In fact, the line is so committed to expansion, it has deployed one of its newest ships, MSC Divina, to sail full-time from Miami. Likewise, the company will put MSC Seaside, a ship the company has said is designed for warm weather, in Miami, from which it will sail year-round. MSC Seaside is being purpose-built for the North American market, a first for the cruise line and debuts in 2017. While MSC Opera had been based in the U.K., the cruise line pulled out of the market in 2015 to concentrate on its core business of fly-cruise Mediterranean sailings. Because of the international passenger base, announcements generally are read in Italian, French, Spanish, German and English. Life onboard, particularly when it comes to mealtime, follows a more traditional cruise schedule -- set dining times and seatmates, and a handful of optional eateries that include sushi, a buffet and an Italian restaurant. The ships offer a standout range of unique evening entertainment offerings, from smoochy dance music to classical concerts, Cirque du Soleil-esque aerobatic shows to jazz. While MSC cruises are typically priced at very value-oriented levels (i.e. comparatively cheap cruise fares), the ships offer a fairly unprecedented range of services and amenities that cost extra, such as a la carte menus and fees for port shuttles. In Europe, from the Mediterranean to the Baltic, the ships attract a very strong European crowd. (U.K.- and Ireland-based cruise travelers are becoming increasingly well-represented.) Caribbean sailings are geared more strongly to North American travelers. With its newer ships, the line attracts numerous retirees during the winter season, while its efforts to cater to families during the summer and school holidays mean there are lots of kids at those times. MSC's more classic vessels -- which lack state-of-the-art kids' facilities and sail on longer, more exotic itineraries -- are tailored to older travelers. The 65,542-ton, 1,952-passenger Armonia and Sinfonia, which were acquired from the defunct First European/Festival Cruises and were originally called European Vision and European Stars, respectively -- were built in 2001 and 2002. 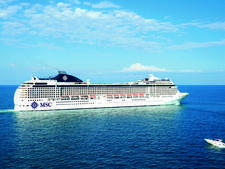 MSC's first new-builds started with the 65,591-ton, 1,984-passenger MSC Lirica, debuting in 2003. MSC Opera followed a year later; it's largely a sister ship, though some alterations were made to cabin configurations (fewer mini-suites, more standard staterooms with private balconies). Interestingly, this pair is a slightly evolved design-mate with Armonia and Sinfonia. All four of these ships were "stretched" as part of a €200 million, two-year refurbishment program in 2014–2015 that saw a nearly 80-foot-long section sandwiched into the middle of each ship. The "stretching" procedure added nearly 200 more cabins -- 94 of which have balconies. During the refurbishment, the line also took the chance to update the spa and childcare facilities, as well as to add an interactive water feature called the Spray Park to the top deck. MSC's Musica Class began with the 92,409-ton, 2,550-passenger Musica, launched in 2006. Musica featured an innovative new design for MSC; introduced on this vessel were more contemporary features, such as a sprawling spa, a wider range of dining venues -- like the now-standard wine bar -- and a much higher number of balcony cabins. MSC Musica has since been followed by siblings MSC Orchestra and MSC Poesia (launched in 2007 and 2008, respectively). MSC Magnifica, the fourth ship in the class, launched in 2010. The introduction of the Fantasia class -- four ships that carry at least 3,300 passengers and are at least 137,963 tons -- was even more revolutionary for the line. MSC Fantasia debuted in December 2008; MSC Splendida, a sister ship, debuted in 2009; MSC Divina launched in 2012; and the line's largest, MSC Preziosa, debuted in March 2013. In March 2014, MSC announced two new-builds (with an option on two more) mega-ships. The first, MSC Meraviglia is due for delivery in May 2017. The second, MSC Bellissima, is scheduled to be delivered in March 2019. In December 2016, MSC finalized the deal for the two additional Meraviglia Plus ships, which will be delivered in October 2019 and September 2020. By passenger capacity, they will become the second-largest ships in the world (after Oasis and Allure of the Seas). The 167,600-gross-ton MSC Meraviglia will have 2,250 cabins holding 4,488 passengers in double occupancy, and a maximum capacity of 5,714 passengers and 1,536 crew members. Among the new features will be specially designed cabins for families and an extended MSC Yacht Club that will include a large solarium, a private lounge and restaurant, and duplex suites. The ships will be more environmentally friendly, with a hull and propulsion system optimized for energy efficiency and fuel scrubbers to reduce CO2 emissions. MSC Meraviglia will be based in the Mediterranean. MSC has not confirmed where the additional three ships will be deployed, but speculation is high that one will be based in the Mediterranean and another could be deployed in the U.S. 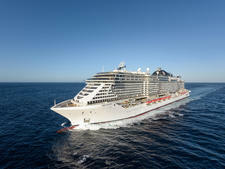 Since MSC Lirica, all of the line's new-builds have been built at France's STX Europe shipyard. But in May 2014 the line announced it had signed for two further new builds (with an option on a third), which will be built at Italy's Fincantieri shipyard. The first of the 160,000-ton, 4,134-passenger ships is called MSC Seaside, and is the first of a new class for MSC -- Seaside Class. MSC Seaside launched in November 2017 and MSC Seaview launched in June 2018. It will homeport in Brazil. There's also an option for a third ship, which would launch in 2021. The line describes the new design as "revolutionary" and says it will pave the way for a new generation of cruise ships. The new features includes a sea-level promenade that circumnavigates the ship with outdoor spaces, shops and restaurants, and a unique aft which looks like a Miami condo. MSC Meraviglia is being built in the same shipyard as the Oasis class ships -- STX France -- and will be the biggest ship ever built by a European-based cruise line. Meraviglia -- the name means "wonder" in Italian -- will spend its first summer sailing the western Mediterranean with three homeports: Genoa, Marseille and Barcelona. A second Meraviglia class ship -- MSC Bellissima -- launches in March 2019. An even bigger version -- Meraviglia-plus class -- launches in 2019; the first ship will be called Grandiosa. The second, Virtuosa, launches in 2020. The two new Meraviglia Plus ships will have a capacity of nearly 6,300 passengers plus 1,700 crew. The 5,400-passenger ships, slated for delivery in 2022, 2024, 2025 and 2026. The ships are being built in the same shipyard as the line's Meraviglia ships -- STX France -- and will be the biggest ships ever built by a European-based cruise line.